Every so often an academic finding gets into the political bloodstream. A leading example is “The Great Gatsby Curve,” describing an inverse relationship between income inequality and intergenerational mobility. Born in 2011, the Curve has attracted plaudits and opprobrium in almost equal measure. Over the next couple of weeks, Social Mobility Memos is airing opinions from both sides of the argument (see previous posts here). How do inequality and social mobility influence each other? That is the central question raised by The Great Gatsby Curve and motivating this series. One particular worry is that the combination of high inequality and low mobility could influence the behavior of disadvantaged youth in ways that further diminishes their chances of success. Then inequality begins to look like a vicious circle. A case in point: finishing high school. In our latest research, we investigate whether high income inequality and low social mobility lead young people from lower socioeconomic status (SES) households to drop out of high school—a decision that has important consequences for their ability to climb the economic ladder. It is already clear that income inequality and dropout rates across states and cities are correlated; the purpose of our econometric investigation is to assess whether this correlation reflects a causal relationship. This finding holds up in more sophisticated econometric analyses, after controlling for a host of individual and state level characteristics. 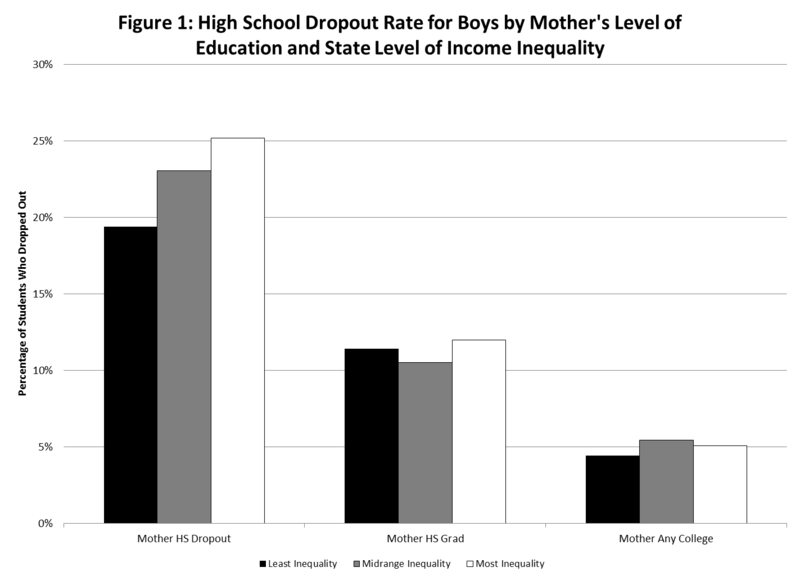 In particular, we find that moving from a low-inequality state to a high-inequality state increases the likelihood that a low-SES male student will drop out of high school by 4.1 percentage points. Of course, there could be something else going on in a state or city (technically, Metropolitan Statistical Area) that explains the relationship. So we examine the influence of other features of the income distribution; the industrial composition of the labor market; the demographic characteristics of the state population (including racial composition and fraction of single parent households); rates of residential segregation by race or income; and public school financing, among other possibilities. None of these explain the main finding. We also explore the possibility that the relationship we observe is attributable to the distribution of ability. Including a measure of cognitive ability at age 17 reduces our estimate of the impact of inequality on high school dropout rates—but only slightly. In short, there is good reason to believe we are seeing a causal relationship. The danger is that inequality and low mobility become locked into a self-perpetuating cycle. So we need policies that give every child and young person a reason to believe in the prospect of a better future. Hope matters.